An updated FoodWorks at Graham Dining Center has a new lounge area, along with an expanded selection of food items. FoodWorks at Graham Dining Center on Mount Olympus and Sadler Dining Center underwent renovations that have expanded spaces and implemented new colors, lighting and furniture, along with many other new features. Syracuse University Food Services Director David George can already tell both spaces have been a hit. Sadler Dining Center, which is accessed through Sadler Residence Hall, now opens its doors to diners from an outside, ADA-accessible entrance, an important new feature, says Mark Tewksbury, assistant director of residential dining and Dome operations with Food Services. Visitors then can head down into the eatery through the stairs or by elevator. The dining space, which underwent a major remodel in 1995, with a smaller upgrade in 2000, has expanded to accommodate 150 more seats, making it more spacious with booth seating and an outdoor view on East Raynor Street, across the street from the College of Law’s under-construction Dineen Hall. More students have been using the facility since the construction of SUNY College of Environmental Science and Forestry’s Centennial Hall, which doesn’t have its own dining facility. “We noticed the need to increase the size of dining room; everybody fit before, but it was not as comfortable as it could be,” Tewksbury says. Students make their selections during lunch at Sadler Dining Center. Sadler is also the site of a new trayless pilot program. The traditional tray rails along the food service counters have been replaced by a flat surface to accommodate plates. The trayless system allows for fewer items to wash, using less energy and water, and helps reduce food waste, George says. SU’s Sustainability Division has worked with Food Services for a couple of years to perform tray-waste audits to measure its potential success. “The data from our spring 2012 Tray-Waste Campaign in Brockway Dining Center did show a decrease in leftover food items left on plates when a tray was not used,” says Melissa Cadwell, marketing manager for the Sustainability Division. The results at Sadler could be promising for other locations. “If the pilot works, we’ll expand it to other areas,” George says. The renovated and more spacious food station areas have also allowed for more expansive specialty food bars and cook-to-order areas, including a Sbarro pizza station, a deli bar and taco bar, that can run simultaneously and for longer hours. Helping to meet the special needs of students, “We work individually with students on special diets or allergies in any of our facilities, but we were able to add a gluten-free spot in Sadler,” George says. At the end of the meal, diners can now help composting efforts by discarding food and other dining waste into separate receptacles before returning plates and silverware. Food Services and Physical Plant drivers partner to transport compost to the Onondaga County Resource Recovery Agency composting site. Outside the renovated facility, a green roof over a portion of the kitchen facilities helps with run-off and provides a green setting. Workers are also finishing up landscaping and outdoor design elements, which have included an exterior of light-colored wood accents. 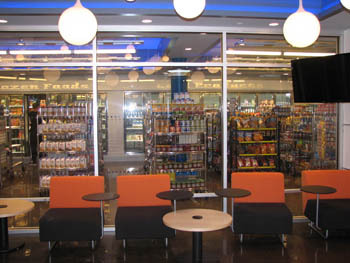 On Mount Olympus, the FoodWorks convenience food store, located below Graham Dining, is now more of a combined space with the Junction snack bar. A stairwell that had not been in use was taken out to accommodate an expanded footprint. 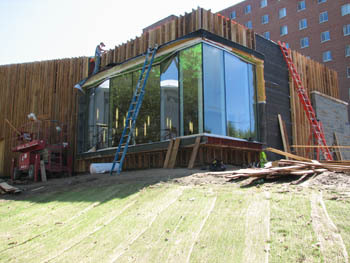 Workers finish up the last of the exterior and landscaping work at Sadler Dining Center. The space, which connects Flint and Day halls and both to the dining hall, now is more wide open, with a shiny concrete floor, funky lighting, blue and orange accents, and a comfy seating area with tables and chairs and extra outlets to plug in gadgets for prolonged periods or work or relaxing. The store now sells more fresh produce, frozen foods, milk and microwaveable products, along with snacks. “It was more of a facelift and we tried to improve the flow and pattern for students,” George says. FoodWorks is now similar to FoodWorks II at Ernie Davis Hall and West Campus Express, which opened last December in Campus West housing. West Campus Express, which is also located in a space alongside Starbucks, also carries an expanded area of fresh produce; microwaveable and stovetop options for meals; organic, vegan and vegetarian, and gluten-free products; and cleaning and personal care items. 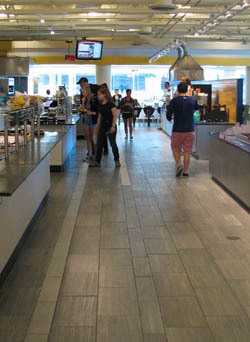 The Sadler renovation and the addition of West Campus Express and Starbucks made sense for Food Services. “The west side of campus has been growing with the addition of Campus West housing and Centennial Hall and now with Dineen Hall, so that’s where we’ve had to develop,” George says. Along with keeping its facilities up-to-date, Food Services is constantly looking at the food and meals that students enjoy and new trends in recipes. Recipes for vegetarian and vegan entrees were updated and new items added, including black and white bean cakes. Food Services encourages students and parents to send in family recipes that might turn into a dining hall specialty. A Recipe from Home theme dinner is held every spring. “While we have a cycle menu that we use, we’re constantly looking at different things that are out there,” George says.